Born on the island of Cuba, Paquito D’Rivera began his career as a child prodigy. A restless musical genius during his teen years, Mr. D’Rivera created various original and ground-breaking musical ensembles. As a founding member of the Orquesta Cubana de Musica Moderna, he directed that group for two years, while at the same time playing both the clarinet and saxophone with the Cuban National Symphony Orchestra. He was a founding member and co-director of the innovative musical ensemble Irakere. With its explosive mixture of jazz, rock, classnd traditional Cuban music never before heard, Irakere toured extensively throughout America and Europe, won several Grammy nominations (1979, 1980) and a Grammy (1979). Funk Tango, the first release of D’Rivera’s new label, Paquito Records, recently won his 9th GRAMMY for "Best Latin Jazz Album" in 2007. An 8th GRAMMY came in 2005 for Riberas, for "Best Classical Recording" with the Buenos Aires String Quartet. He also won a GRAMMY for "Best Instrumental Composition" in 2004 for his “Merengue” as performed by the distinguished cellist Yo-Yo Ma. In 2000, D'Rivera's Tropicana Nights received a GRAMMY. That same year, he received a nomination in the classical category for his Music of Two Worlds, featuring compositions by Schubert, Brahms, Guastavino, Villa Lobos, and Mr. D’Rivera himself. In 2001 the Latin Recording Academy awarded a GRAMMY for his Quintet’s recording of Live at the Blue Note along with a nomination in the Classical Crossover category for The Clarinetist Vol. I(Pimienta Records). In 2002, he won again as a guest artist on the Bebo Valdes Trio's recording El Arte Del Sabor. 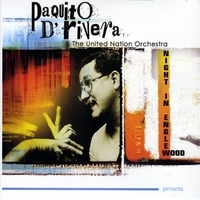 Paquito D'Rivera is the first artist to win Latin GRAMMY's in both Classical and Latin Jazz categories (2003), for Stravinsky’s Historia del Soldado (L'Histoire du Soldat) (Pimienta Records)and Brazilian Dreams with the New York Voices. With the better-known sidemen on this 1993 CD including first trumpeter Byron Stripling, trombonist Conrad Herwig and tenor saxophonist Mario Rivera, additional solo space was allocated to some of the other talented players as were guest spots for trumpeter Claudio Roditi, trombonist Slide Hampton and vibraphonist Dave Samuels. A Night in Englewood is an easily recommended set. The music is very Latin-oriented and shows that the orchestra had moved away from Gillespie's usual repertoire to exclusively feature originals by bandmembers (including D'Rivera's "I Remember Diz"). D’Rivera is a recipient of the National Medal for the Arts, presented at the White House by President George W. Bush in 2005 and was named one of the 2005 NEA (National Endowment for the Arts) Jazz Masters. In both 2004 and 2006, the Jazz Journalists Association honored Mr. D’Rivera as the Clarinetist of the Year. In March 2007 he was honored with the Living Jazz Legend Award in a ceremony at the Kennedy Center in Washington, DC. 2008 awards include the International Association for Jazz Education (IAJE) President’s Award, and the Frankfurter Musikpreis. This is one of those rare CDs where every track is wonderful. Great Melodies, Great Improvisations, Great percussion. It is Cool and it is Hot. My copy is in my car right now. I've got over 600 CDs and this one is at least 10 years old. If you like Contemporary Big Bands or Latin Jazz you will love this recording. It's Pure Gold.